The RP Photonics Buyer's Guide contains 31 suppliers for light-emitting diodes. Ask RP Photonics for advice concerning the use of LEDs and other lighting products. An extensive expertise on both optics and energy matters is available. A light-emitting diode (LED) is an optoelectronic device which generates light via electroluminescence. It contains a p–n junction, through which an electric current is sent. In the heterojunction, the current generates electrons and holes, which release their energy portions as photons when they recombine. Although the fundamental process of light generation is the same as in laser diodes, light-emitting diodes do not exhibit laser action, i.e., they usually do not exploit stimulated emission. Their optical spectrum is substantially wider. In 2014, the Nobel Prize in Physics 2014  was awarded to Isamu Akasaki, Hiroshi Amano and Shuji Nakamura “for the invention of efficient blue light-emitting diodes which has enabled bright and energy-saving white light sources”. Before that work was done, efficient blue LEDs could not be made, and therefore also no white-emitting LEDs as usually needed for illumination purposes. The researchers succeeded in developing efficient blue-emitting LEDs based on indium gallium nitride (InGaN). Methods had to be developed for producing such materials with a high quality. Surprisingly, a high device efficiency could be reached despite still substantial defect densities. As a result of these developments, LED-based illumination has recently started to be used on a large scale, partly replacing traditional incandescent lamps. As LED-based illumination is far more energy-efficient, substantial reductions of emissions in power stations (CO2, poisonous gases, heavy metals etc.) have become possible. Figure 1: Two light-emitting diodes, emitting white and red light. The center wavelength and thus the emission color of an LED are largely determined by the bandgap energy of the semiconductor material used. Essentially the whole visible wavelength region can be covered with LEDs, although the achievable power output and efficiency is not equally high for all wavelengths. Most LED chips are made of inorganic semiconductor materials. For deep red emission, aluminum gallium arsenide (AlGaAs) can be used, which is otherwise common for near-infrared laser diodes. Shorter wavelengths in the red spectral region are achieved with gallium arsenide phosphide (GaAsP) and aluminum indium gallium phosphide (AlInGaP). The internal quantum efficiency can be close to 100% for emission wavelengths around 650 nm, whereas high efficiencies are much more difficult to achieve at shorter wavelengths of e.g. 620 nm, where the human eye is more sensitive. Another challenge is that the temperature increase, which is hardly avoidable in high-power LEDs, decreases the quantum efficiency and increases the emission wavelength. Effective cooling methods are therefore essential for high-power LEDs. Note that although the thermal power involved is not very large, it is released within a very small volume and area. It is not uncommon to have several watts dissipated on one millimeter squared. Indium gallium nitride (InGaN) is very suitable for blue and violet LEDs. Despite high defect densities in these materials [3, 16], internal quantum efficiencies above 70% or even above 90% are achieved. Longer wavelengths (green and yellow) are obtained by increasing the indium (In) content, but the efficiency drops sharply as the wavelength is increased. Figure 2: Two high-power LEDs from OSRAM Opto Semiconductors, shown with permission from the producer. The device on the right side contains four chips: two for green emission and one for red and blue emission. That device is used for image projectors. The technologically most difficult spectral region (in the visible range) is that of green–yellow–orange light. Intense research is being pursued to fill this gap, called the green gap. LEDs based on GaAsP have a lower efficiency than e.g. red LEDs. Zinc selenide (ZnSe) and zinc selenide telluride (ZnSeTe) have been developed for green emission, but the device lifetimes and efficiencies are not satisfactory for lighting purposes. Various others materials, including both modified II-VI alloys and oxychalcogenides such as LaCuOS, are therefore under consideration. Table 1: Typical semiconductor materials and emission wavelengths of light-emitting diodes. White light can be generated either by mixing the outputs of e.g. red, green and blue LEDs, or by using a single blue LED and some phosphor, which converts part of the blue light into light with longer wavelengths. That conversion is normally done either with another semiconductor (e.g. ZnS), or with a scintillator crystal containing rare earth ions such as Eu2+ (europium) or Ce3+ (cerium). For example, Ce3+:YAG can be used for converting blue light around 440–460 nm into yellow light around 520–640 nm. Modified hosts, e.g. with some of the yttrium in YAG being replaced with gadolinium (Gd3+), lead to shifted emission ranges of the cerium ions. The color rendering index of such white LEDs is usually not very high, but it can be improved e.g. by combining yellow and red phosphors. There are also near-infrared LEDs, based e.g. on AlGaAs, and ultraviolet LEDs, using materials such as gallium nitride (GaN). A more recent development is that of LEDs based on organic semiconductors, called OLEDs (organic light-emitting diodes). Such devices are constructed with methods which are entirely different from those for inorganic LEDs; they are assembled from various thin elastic layers for functions like cathode and anode, transport layers, emissive layer etc. It is even possible to use biological materials; for example, DNA molecules can exhibit highly efficient electroluminescence. Such materials have a potential for cheap mass fabrication of large and mechanically flexible devices. They therefore appear to be very promising for future lighting applications. However, further research and development are required for improving the efficiency and the device lifetime (the latter particularly for blue OLEDs), apart from reducing the cost. For example, OLED-based TVs have attractive looking displays with bright colors with little dependence on viewing direction, but they are expensive and can suffer from burn-in problems related to LED degradation. This article focuses mainly on inorganic LEDs. LEDs can be made as surface-emitting or edge-emitting devices. (That distinction is the same as for surface-emitting and edge-emitting semiconductor lasers.) Further sub-categories are discussed in the following sections. Figure 3: Structure of a flat-diode LED. The active area (shown in red) is slightly below the emitting surface. Surface-emitting LEDs (SLEDs) have a thin active layer parallel to the surface from which the light extracted. In a simple flat-diode configuration (Figure 3), the active layer is just below the emitting surface, and the current is applied with a ring electrode. The light emitted in the “wrong” direction is absorbed by the substrate. There are also devices where the substrate is made transparent, and the back electrode reflects back that light, so that at least some part of it can be used. A variant is the Burrus-type LED, where the active layer can be deeper within the originally grown semiconductor structure, and a trench etched into the structure allows for more efficient light extraction. It is also possible to introduce a fiber into the trench in order to obtain a fiber-coupled LED. A special type is the resonant-cavity LED (RC-LED), which has the light-emitting semiconductor junction embedded between two distributed Bragg reflectors (Bragg mirrors), i.e. in an optical resonator. Due to the moderate Q factor, lasing does not occur, but a larger directionality is obtained, compared with conventional LEDs. This concept makes it easier to achieve efficient light extraction and increases the brightness of the output, from which e.g. applications in fiber-optic communications can profit. The external quantum efficiency can easily exceed 20%. The emission bandwidth is smaller than for other LEDs. Edge-emitting LEDs have a structure similar to that of edge-emitting semiconductor lasers: they are emitting from the edge of a cleaved wafer, where the active region meets the cleaved surface. Such devices allow more efficient fiber coupling than surface-emitting LEDs. Applied in optical fiber communications, they allow higher data rates. A variant of the edge-emitting LED is the superluminescent diode (SLD), where the spontaneous emission is substantially amplified within a waveguide. Here, the emission is much more directional, and as a consequence the brightness is much higher, even for SLDs with quite low output power. Light emitted by LEDs has a low spatial coherence. It is originally emitted in all directions. Even though many LED devices emit light preferentially in one direction (often via built-in reflecting structures), the focusability (beam quality) is very low, compared with, e.g., that of laser diodes. The emission bandwidth is typically some tens of nanometers (e.g. 40 nm) or even > 100 nm, i.e., much broader than for laser diodes, and comparable to that of superluminescent diodes. This means that the temporal coherence is much lower than that of a laser, although it is much higher than for, e.g., an incandescent bulb. The internal process of generating light in an LED, as described above, can have a very high quantum efficiency and power efficiency, at least in the blue–violet and in the red spectral region. Nevertheless, the device efficiency of early light-emitting diodes was relatively poor. The reason is that it was not possible to extract the internally generated light efficiently; most of the generated light was absorbed inside the device. A key challenge is total internal reflection at the surface of the semiconductor material: due to the high refractive index, light can escape only for relatively small angles of incidence, and even then there is substantial Fresnel reflection. In some LEDs, there is also a problem with reabsorption of light in the substrate. In the 1990s, advanced LED designs were developed which allow fairly efficient light extraction and thus reach much higher device efficiencies. Examples for measures used are roughened surfaces and integrated photonic crystal structures. The luminous efficacy can now be well over 200 lm/W, i.e. substantially better than that of fluorescent lamps. Besides the efficacy of the light source itself, the directional emission makes it easier to achieve a high efficacy of the overall lighting system, comparing with omnidirectional emitters where a lot of light can be lost in a lamp housing. A possible problem (called “efficiency droop”) of GaInN-based blue LEDs, as also used in white LEDs, is that the efficacy tends to be decreased substantially when the LED is strongly pumped (for high-power operation). That problem appears to be caused by direct and indirect Auger effects . Light-emitting diodes based on inorganic semiconductors can have very long lifetimes, which can exceed 100 000 hours. LEDs are therefore belonging to the most long-lived illumination devices. On the other hand, LEDs are relatively sensitive to excessive reverse voltages, and can be destroyed by electrostatic discharge when improperly handled. Also, the lifetime is severely reduced for operation with a too high current and/or at too high ambient temperatures. As with any other semiconductor diode, a current can flow through an LED only from the p-doped part to the n-doped part (conventional current direction). A reverse voltage of a more than a few volts can destroy an LED. In the forward direction, the current remains very small for low voltages and then rises very quickly (exponentially) with increasing voltage. Therefore, LEDs normally cannot be operated with a constant voltage; the current needs to be stabilized, e.g. by operation with a current source, or by using a simple series resistance for connecting to a constant voltage supply. The emitted optical power is proportional to the operation current, except if the induced increase of temperature decreases the quantum efficiency. 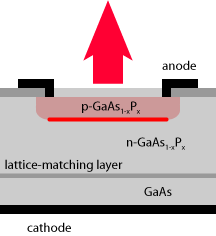 The operation voltage is largely determined by the bandgap energy of the material, and thus by the emission wavelength; red LEDs may be operated with less than 2 V, while blue ones require of the order of 4 V.
The device efficiency (see above) can be very high, leading to a small electric power consumption and low heat generation. The effective efficiency of a lamp is often further improved by the more directed emission of LEDs, reducing the amount of light that is lost in the lamp housing. The device lifetime (see above) is very long. It normally ends with a gradual loss of brightness, rather than with abrupt failure. Larger LED lights contain multiple LEDs, and can remain largely functional when single LEDs fail. This is particularly important where safety is critical (e.g. for traffic lights). Light with specific colors (e.g. for traffic lights) can be directly generated. This is more efficient than using e.g. an incandescent lamp with a color filter, which has to absorb much of the generated optical power. LEDs can be used in very compact and lightweight packages. They are mechanically very robust and can tolerate even severe mechanical shocks. When white light is generated by using separate red, green and blue LEDs, the color tone can be adjusted by adjusting the relative operation currents. Dimming is possible by reducing the current or by quickly switching it on and off with a variable duty cycle. In any case, the power efficiency is preserved when dimming an LED, and the color tone remains unchanged. Both would not be the case for a dimmed incandescent lamp. The output power of a light-emitting diode can be very quickly modulated. Modulation frequencies of hundreds of megahertz are possible, since the carrier lifetime is only a few nanoseconds. This is useful e.g. for optical data transmission. LEDs contain poisonous substances such as gallium arsenide, but only in small quantities. The cost per watt of output power of an LED for illumination is relatively high, but dropping rapidly with further advances of the technology – mainly by increasing the output power of the LED chips. Also, the higher cost may be offset by reduced electricity consumption and the long lifetime. Although an LED produces less heat than an incandescent lamp with the same optical power, adequate heat sinking is necessary to prevent overheating, which would degrade the lifetime. The color rendering index of some white LEDs is low, making them unsuitable for certain applications. As the available electric supplies usually provide an (approximately) constant voltage, the operation current needs to be stabilized with some electronics. Fairly simple electronics may used, but often spoil the overall power efficiency. Small LEDs are very widely used as small signal lights. Operated with a current of e.g. 5–20 mA, such devices produce enough light to be seen in normal ambient light conditions, and different colors can be used, e.g. to signal different states of a device. As LEDs can be quickly modulated, they are suitable for optical fiber communications over short distances. While the poor directionality of their emission requires the use of multimode fibers and thus restricts the transmission distances, the cost is significantly lower than for a system with single-mode fibers and laser diode transmitters. Moderately fast power modulation is also useful, e.g., for application in light barriers, as the modulated LED light is easily distinguished from the ambient light, and for remote controls. The enormous progress in high-power LEDs has recently made it possible to use LEDs for larger signals and for lighting purposes. As the cost per watt is still relatively high, and the output power is limited, such applications started in areas such as traffic lights and stop lights for cars, where moderate optical powers are sufficient, the long lifetime is particularly important, and the efficiency advantage over a filtered incandescent lamp is very large. LEDs are also widely used for the background illumination of liquid crystal displays, e.g. in screens of portable computers (laptops), media players and cell phones, where the reduced electricity consumption allows for a longer time with battery-powered operation. Another advantage for computer and TV screens is that brighter colors can be achieved, comparing with fluorescent lamp backlights. The highest display quality is often achieved with OLEDs, which however increases the cost while decreasing the lifetime. Further improved devices will soon make it possible to use high-power white LEDs for the main lights of cars, for residential lighting and street lights. In some areas such as airplanes, the compact package size and the low electricity consumption are particularly important.